Remembering that the Founding Fathers did not want political parties, I think all political parties should be abolished as they are unethical and unconstitutional. What is a political party? It is a group of people being told how they should believe and how to live, and what to do and say. We believe that this country was founded on the principle of “by the people” and “for the people”, not “by the party” and “for the party”. All Candidates should run on their name, and their own merit, not a group badge. …the United States Constitution has always been silent on the issue of political parties; at the time it was signed in 1787, there were no parties in the nation. Indeed, no nation in the world had voter-based political parties. The need to win popular support in a republic led to the American invention of voter-based political parties in the 1790s. Americans were especially innovative in devising new campaign techniques that linked public opinion with public policy through the party. So, let’s see if people are looking for a third-party Candidate. 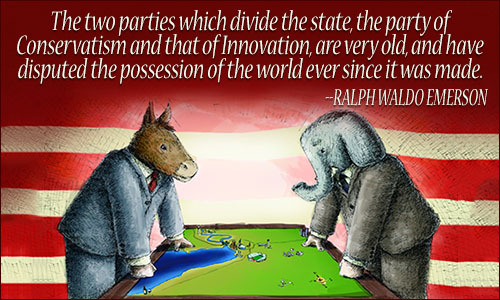 If the U.S. is ready for a Third-Party the time to stop voting Democrat and Republican is now. The Libertarians and the Green Party are both high profile Candidates in this year’s election. Of course, the Republican and Democrat remains as the standard agenda dictates. And therein lies the problem. The media has been the dictator of elections in as much as the Third-Party Candidates do not get the same publicity in any form, and media most definitely does not allow fairness in the “debates”. All major parties should be included in the debates. If equal publicity for all candidates were maintained it could change the outcome considerably. Some people may fear change because they fear terrorism and war and believe it could be imminent in a Republican or Third-Party Presidency. To answer that I would say that, who is responsible for ISIS terrorism? Sept 11th happened and the U.S blamed and then attacked the Taliban and Bin Laden and Afghanistan. The U.S. goes to the U.N. to get a coalition. Everything progressed well until the French started arguing that more diplomacy is needed, and that no attacks should happen. In doing so they could dissuade more countries from helping the U.S. All of Europe except Great Britain pulled out their forces and dropped their support. So why do we support the French? Their diplomacy is why I think ISIS is still around. It is because of France that we are in debt because after WWII President Roosevelt decided that the debt the French had incurred from us helping them would be forgiven. The bombings in Belgium and France are terrible and they never should have happened. If we had had the support, we needed they never would have happened. The bottom line is that ISIS needs to be stopped and we need a full coalition of countries to accomplish that. Meanwhile, France preaches diplomacy and we get nowhere because ISIS is not diplomatic! We need to unite this world and fight for peace!